Since we only have the capacity to focus on a fraction of what we encounter, our brains are constantly filtering what gets our attention. In this filtering process, our brains are easily distracted because we are wired to pay attention to any new stimulus, especially if we perceive it to be a threat to our survival. This filtering causes us to have what psychologists call a negativity bias. Negativity bias has been useful for our ancestors’ survival, as they were on the constant lookout for danger. Unfortunately, in the world we live in today, media and society takes advantage of negativity bias, feeding us images and stories designed to grab our attention but not necessarily to benefit us. Now that you know people have a tendency to have negativity bias, you can also see why shifting to a What’s Going Well mindset is a giant leap for most people. People have a concern about challenges or serious issues. They feel like focusing on what’s going well can be like burying their head in the sand and avoiding real issues rather than taking them head on. Sometimes focusing on What’s Going Well may not be appropriate. People are worried that using a what’s going well mindset in the wrong situation could be detrimental to relationships or their own ability to make it through challenging situations. People wonder if focusing on what’s going well is a naïve point of view. They feel that by focusing on what’s going well they will avoid tackling challenges or playing an important role as a problem solver. People have a predisposition to negativity. In other words, people resist focusing on what’s going well because they prefer focusing on what’s going wrong. These concerns are reasonable, and I acknowledge them. I still believe that having a What’s Going Well mindset is by far the best approach. Here are my responses to excuses I hear about why a what’s going well mindset won’t work. When people say that what’s going well avoids talking about problems or dealing with challenges I would never advocate for a person or a team to avoid problems or challenges. I think it is critical that we focus on what’s going well first because it will give us the energy to deal with problems. Starting with what’s going well enhances relationships and bonds people so they can deal with problems together. It helps them focus on their commonalities rather than differences. A What’s Going Well mindset is far from naïve because it is not about denying or ignoring negative aspects it’s about choosing to appreciate the positives as well – it’s a more balanced approach. Since we have a bias towards negativity then we need to flex the what’s going well muscle and use it regularly. Like a muscle, you have to use it regularly to build its strength. 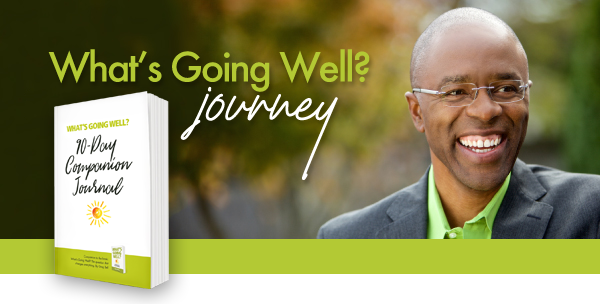 Subscribe to the What’s Going Well journey emails. We’ll send you weekly emails with journal exercises over the course of 90 days to support you in your What’s Going Well journey!